Ravi Shankar’s mug shot from an arrest in Middletown last year. The state’s largest public college system has paid a professor with multiple criminal convictions $60,409 in exchange for his resignation and dismissal of all pending legal complaints against the Board of Regents. 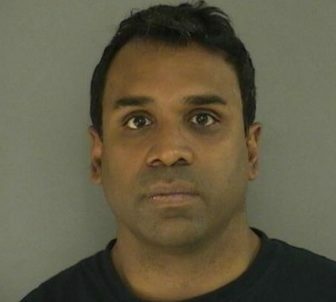 Ravi Shankar, a poetry professor at Central Connecticut State University, has been convicted of offenses that include driving under the influence, giving a police officer someone else’s license after getting into a collision, and providing a false statement to authorities in a credit-card fraud scheme. He also has been charged with several other offenses, including driving with a suspended license, in recent months. Facing scrutiny, the public system’s governing board considered rescinding a recent promotion Shankar received but backed off when it became clear that the Code of Conduct in the current labor contract with the union that represents faculty does not provide for consideration of a criminal record for incidents that take place off campus. Michael Kozlowski, a spokesman for the system, said the regents continue to seek changes to the union contract so that they can consider convictions of employees when making hiring and firing decisions. Kozlowski said the settlement was necessary to move forward. “We are pleased it’s over and we can get past it,” he said. Shankar had levied several claims against the public university system. With this $60,409 settlement, Shankar promised to dismiss any complaints or lawsuits.